One day I discovered on le site sur l'Art Roman en Bourgogne that there were two churches in the capital of our canton Saint-Gengoux-le-National, one church with 3 star status dedicated to Saint-Gengoult, and another, former church with 1 / 2 star status dedicated to Saint-Gengoul. "Saint Gengoux, indeed two monuments. The first is the well known church, which has its own page on my site. The second one is unknown; there are remains of a 10th century predecessor of the other church, in the cemetery. I don't have any pictures of that one, do you know it?" I am always in for a little treasure hunt. 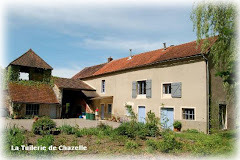 Saint-Gengoux is the place where we buy our wine from the pump, where we are actively involved in the Office de Tourisme, in a word, we come there quite often. 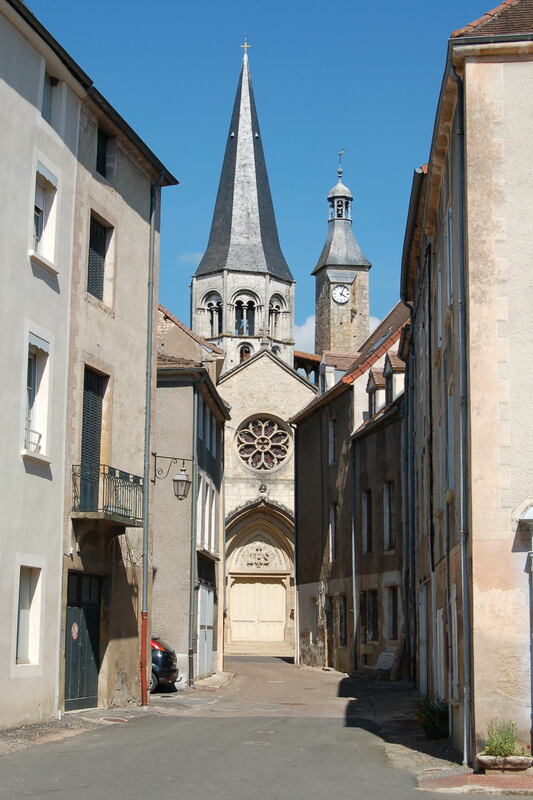 On top of that, the town boast a nice small medieval centre, and it is unrivalled as a tong twister with our camping and gîte guests. Most people don't come much further than "Saint-Jen-Joo-mumble-mumble..." The J is pronounced as in John. Absolute champions are two regular campers; For them Saint-Joo is more than sufficient. It is quite obvious : we have a soft spot for Sen-Jean-Goo. 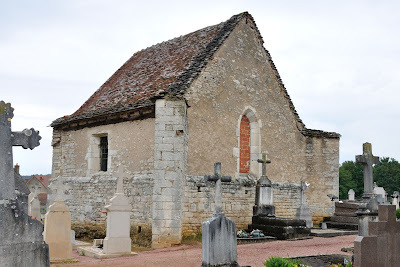 One day, it was dry, but there was a threat of rain, we went to Saint-Gengoux and entered the graveyard there. In the middle of it, amongst the gravestones stood a little building, which could well be a small part of a possible church. The door was locked, but I managed to take some pictures of the outside before the clouds opened. "Wow, that was quick! So the chapel exist, this must be it. However, I do not see any Romanesque traces on the outside, so maybe we should doubt the possibility that the church was built in the 10th century. Or would there be traces on the inside?". Talking of Unemployment Relief Works! For all my pictures of this church, click here. Was taken off the website, for reasons explained in a later blog (to be published). In a book about Cluny, which I regularly consult, I had found reference to a church called Saint-Mayeul, dedicated to the 4th abbot of Cluny, the predecessor of Saint-Odilon. The book is called “Cluny en 200 questions/réponses”, written by Gérard Thélier, a colourful and well known inhabitant of Cluny who knows a lot about Cluny's history. 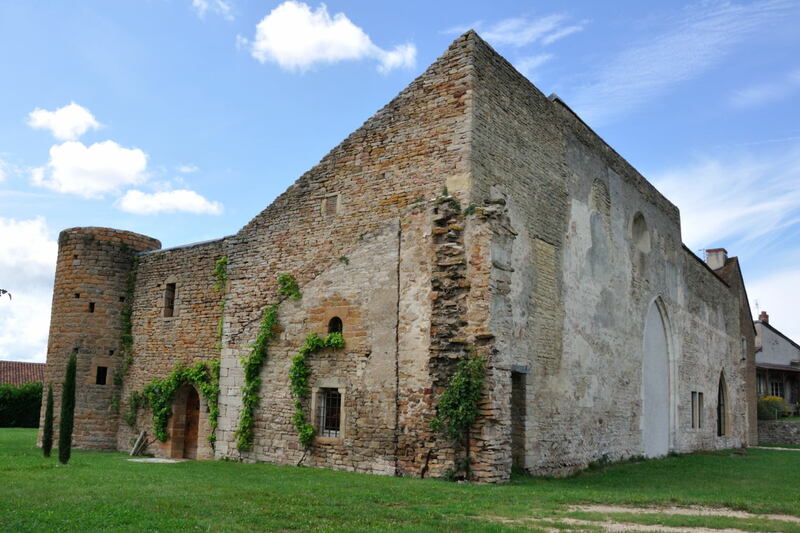 The description of the church was brief : the only remaining wall of the church is visible from the road behind Tour Saint-Mayeul. 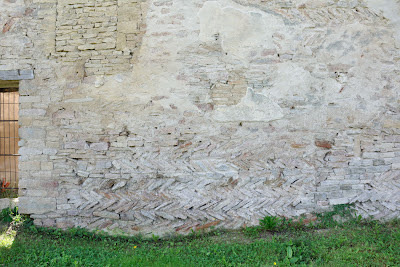 Fortunately there was a photograph of the wall, so at least I knew I did not have to look for a low garden wall. The website le site sur l'Art Roman en Bourgogne mentioned the church, but had no pictures available. Armed with my bible, and hence with a photograph, and knowing where to find the Tour Saint-Mayeul, on a fine day I went into Cluny. The tower was easy to find, it was opposite Cluny's cemetery. 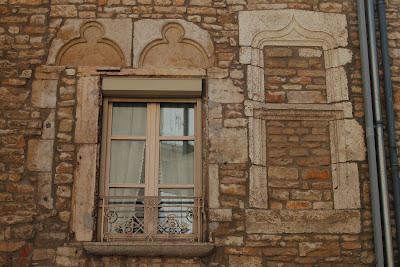 And indeed, the church wall is clearly visible from the Chemin des Trépassés. 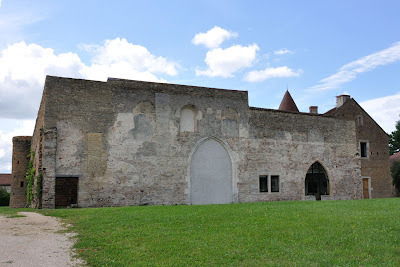 It is part of a private residence, and when I walked around the building it also seemed that the fortified walls of old Cluny were built against the house. For all my pictures of this former church, click here. 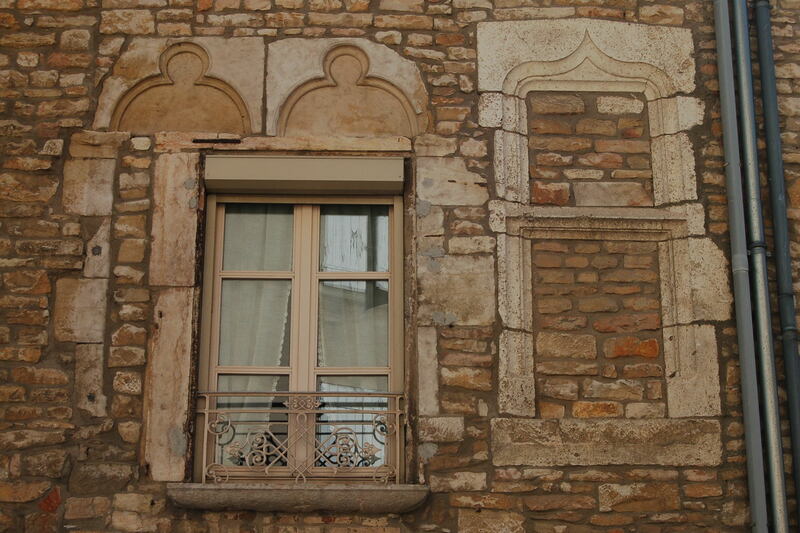 After my visit to the former Sainte-Marie in Bonnay I feel like I am an expert in recognising "Opus Spicatum". That must be something typically Dutch, because every Dutchman who has ever eaten shawarma or hummus will adevertise him or herself as a Middle East expert! For our own website, click here. Na een woelig leven op een kantoorkruk werd ik door omstandigheden richting Frankrijk geduwd. Daar zijn wij, Sue en ik, een heel nieuw leven begonnen. In september 2005 verhuisden we naar Cormatin, met het idee om hier een paar gîtes (appartementen) te openen. Daar hebben we nog geen moment spijt van gehad, en inmiddels na wat aanloopproblemen, lopen de gîtes uitstekend. De omgeving hier loont zich uitstekend voor de actievere vakantieganger. Fietsen, wandelen, skeeleren, hardlopen, er is hier van alles te doen. Het feit dat we bijna aan de Voie Verte liggen (een fietspad van ca. 100 km lang, over het tracé van een oude spoorlijn) maakt La Tuilerie een uitstekende springplank voor korte of lange tochten. Onze meeste, zo niet alle gasten komen hier voor hun rust, wat niet zo moeilijk is. La Tuilerie ligt aan de rand van een bos, en de mensen worden doorgaans gewekt door het gebeier van de kerkklokken van Taizé, ook één van onze grote publiekstrekkers. Ook toeristisch heeft het gebied veel te bieden, zoals Romaanse kerken, châteaux, wijngaarden, burchten, enz.